I’ve been meaning to report on the campsites I stayed at while away for some time now and I’ve finally found the time! There were 22 campsites in total and 4 B&Bs. Here is my take on those I resided at for the first nine nights (others to follow). Note: night 1 won’t be included in this post as I was put up (very kindly) by family members on this particular evening. 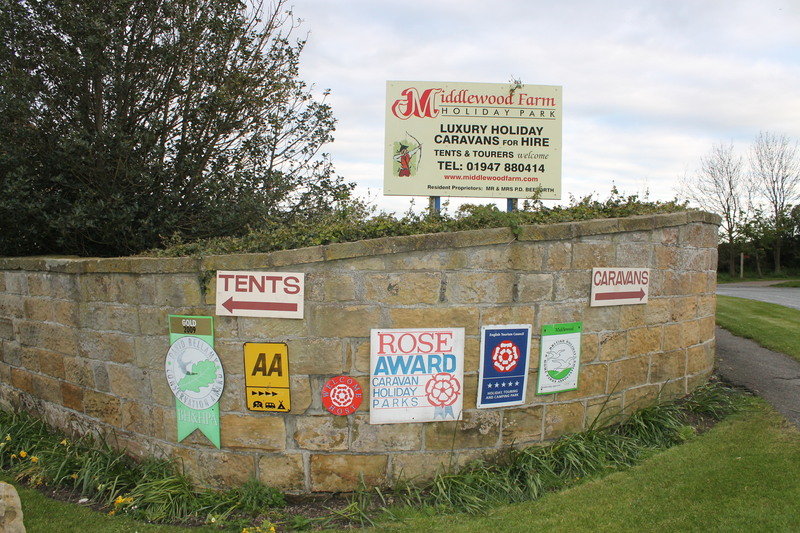 Middlewood Farm in Whitby, which has apparently won a few awards! I’m not going to lie, it wasn’t a great start to my camping experience. It was, in fact, one of the worst campsites I stayed at. Now, I’m not knocking the whole place and I’m sure it’s a great place to take the family if you want to stay in a caravan or wooden hut (see their homepage for an example of said huts), but the camping field was a big, old thing right at the bottom of the site, possibly as far away as you could get from the toilet block with just two measly portaloos that they didn’t recommend you use anyway. It didn’t help that it was a Sunday evening, which meant I had the entire field to myself. The site’s facilities weren’t lacking, that’s for sure. They had a bar, laundry room, the lot, but it is all a little inconveniently placed for campers. Also, the service I received was pretty standard for a large site with no personal touches (which, I went on to find out, certainly aren’t a rarity at the smaller sites). All in all not the best start, but at least I got it out of the way. So, the second night was a vast improvement (site-wise anyway). Judging by the ‘leisure park’ mention in its title if I hadn’t have known better I might have assumed there would be twisty kid’s slides weaving about all over the place, a heated pool and, quite possibly, a spa. However, I came (fairly) well-educated about the site. Its website is very open about what it offers in the summer, but May is not really the summer so I think there was one other family there the night I stayed and no activities (not that I minded, there was no time for sky diving anyway). The owner of the campsite was one of those people who, although I am not a “city-type” by any stretch of the imagination, made me feel a little like one by the way she looked at me (as if she didn’t quite “get” me). Feeling a little odd and only slightly unnerved, I was left to my own devices (including finding the toilet block). The site was fine and I was woken rather early by the rousing tones of the cockerel, which was no surprise seeing as it’s a working farm. Overall opinion, not a bad one, but probably better in the summer. Also, I was delighted to learn that my very own dad was brought up and went to school in nearby villages (fascinating)! Firstly, it is very important to know that this B&B has a pedestrian crossing outside as it’s very helpful when it comes to finding the place (this is shown on the homepage of their website, not sure if it was intentional). So, I had decided to treat myself to a proper bed for the night (without knowing that I would be forced to stay in two more just a couple of nights late – but more on that shortly) and I picked this lovely little place that it nicely positioned in Withernsea, a seaside town where there are fish and chip shops aplenty (I’m not ashamed to say that I did endulge in a little of that – including some ‘scraps’) and a very pleasant promenade to stroll along (I did that too). The room was extremely big with a bathroom big enough to fit a third single bed. The only issue I encountered was that the shower didn’t work, but it wasn’t too tough convincing myself to rest in a nice, warm bath with a cup of tea on hand. Really nice place and friendly owners who, although I didn’t speak to them too much as I was so busy chatting to the man who is walking around the coast (see previous post for more details), were very helpful and keen to chat about the local area. I would recommend this one to anyone heading for Withernsea for sure. What a beauty! I liked this site from the moment I arrived and I think what really helped was that there were actually other people there – and quite a few of them too considering it was mid-week. The toilet block was very nicely kept and, although the site didn’t have many additional facilities, it was a really enjoyable place to stay and I would certainly recommend it to anyone (unless you have a really really old car that simply cannot handle the crazy steep roads of Whitby – mine just about made it). When I arrived and told the owner about my trip he was keen to guide me to the map on the wall and let me know where I could find the Whitby lighthouses the following morning. I decided to make the most of the pleasant evening by taking a stroll down to Robin Hood’s Bay, which is well signposted from the site. It’s a great little walk down to the bay passing through tree-lined paths and the dinky little streets. The walk and proximity to Robin Hood’s Bay really adds to the charm and experience of staying at the campsite. The other campers were really friendly and I spent quite some time chatting to a lady in the bathroom. A really lovely stay at this one. And so I had left the joys of Yorkshire behind along with the chance of finding a campsite that fell within a sensible distance from the coast! I was aware of this situation though and, although I had listed a couple of potential B&Bs in the area, ended up in a somewhat over-priced guest house/pub that I assume can only charge the amount it does because it is the only accommodation available for anyone passing through for a few miles. The room was small, but well-decorated and the walls were a little beyond thin. The bedrooms were above the pub, which I was pleased to find caused little distubance. However, by this time, I had become very protective of Little Car and didn’t like the thought of her being stuck outside at the side of a rather busy road. I was aware that it wasn’t the best area to be staying, surrounded by towns and villages that were crushed by the closing of the mines and the resulting unemployment in the 80s and which still has an impact today. I managed to pass my time here researching the local area and growing a little saddened by the lack of support the surrounding area had gained to get back on its feet over the past 30 years. I met the owner the following morning, a really friendly guy who sent me on my way with some tea bags and waffles, which was a really nice touch and made me a little less appalled by the nightly charge. There is no way I can make any bad comments about this place at all. The owner was so incredibly friendly and so accommodating that I can’t think of one bad point. She made it into my top 5 encounters in my earlier post for her brilliant telephone welcome (involving her back complaint), giving me a choice of room, and her ability to maintain a conversation that lasted over an hour and still didn’t really want me to leave. The guest house was in a great location, just a short stroll across the park to the beach and a only a slightly longer strong to the town centre. My choice of room meant it wasn’t a particularly large space, but I had made the decision and it was a perfect size for me (I sometimes feel a little lost in big rooms)! This wasn’t my first choice of guest house when I was phoning around looking for a room (there are no campsites here either), but having stayed there, if I’m ever back in the area I wouldn’t hesitate to stay again. A big thumbs up from me! By this point we were in full half-term swing and this site was full of tents and caravans sitting nicely alongside the wigwams (I really wanted to find out how much they were for a night, but I think they were all full and probably massively expensive). It was a really family-friendly place, which I actually quite enjoyed for a while until it got to about 9.30pm and I was getting cold and wanting to go to sleep while the parents allowed their children to stay up hours past their usual bedtime. The site had good facilities and enough of them (very important when I am there as I take ages in the bathroom when I’m camping, who knew?!) and some lovely views. The sheep in the next field had clearly welcomed some young’uns recently, which was just a little bit cute. However, there was a cow in a nearby building that sounded like it was in some serious pain (I do hope it was ok). All in all, a really nice site, but not for those who aren’t keen on children. Be warned, my friends! And finally (for this post anyway), we reach my first experience of camping in Scotland where standard tent pegs just don’t want to go into the ground (trust me, I am not lying). My favourite thing about this site was the man who showed me the best pitch he could find. He worked there, of course, he wasn’t just a stranger, and one of his jobs was to direct people to a suitable pitch and he spent a while tramping on the ground near the toilet block as evidence that the grass wasn’t too wet in that area. Really nice man. It was a quiet site yet quite large so everyone was fairly well spaced out (not drug-induced, but physically spread out). There was a couple in a van next to me and the man had a guitar which he had a bit of a moment on the following morning. It wasn’t the most amazing site and was fairly pricey in comparison to some of the others if you’re not a member or the Camping and Caravanning Club, but pleasant enough nonetheless. It’s also a short drive from Barns Ness lighthouse, so I wasn’t complaining. Good post, made me chuckle – i’d like you to do an impression of the Scotsman when i see you next!